Growing and maintaining an attractive beard takes a lot of work. Thanks to grooming tools and subscription kits you can tame your unruly beast of facial hair and maintain a luxurious facial look without the hassle. Whether you want to assemble your own beard care kit or use a beard club and have new products delivered to you on a regular basis we’ve got you covered. Assemble your own ultimate beard care kit with these best beard products. Or if you don’t want to go the DIY route, we’ve included beard grooming kit reviews so you can knock out everything need in one easy purchase. Beard oil is a must unless you want an unruly mess of hair on your face. This leave-in treatment has dual purposes. First, it hydrates your skin and facial hair to relieve itchiness, encourage healthy growth and soften your beard. Second, it’s an excellent styling agent that helps you tame and sculpt your facial hair. We recommend 100% all natural and fragrance-free Prophet and Tools Beard Oil. Be sure to check out our Best Beard Growth Oil article to see our other top picks. If you don’t like the feel of oil, you can always go with a beard wax. Like beard oil, waxes (often called balms) help tame your beard. A great choice is Smooth Viking Beard Balm, which contains shea butter, argan oil and other naturally conditioning ingredients. If you have very wiry and dry facial hair, you also might want to consider Honest Amish Heavy Duty Beard Balm, which is a leave-in conditioner rather than a wax, to provide ultimate control. A beard brush or comb is a necessity for a well-groomed beard. Brushing your beard daily helps to keep stubborn hairs at bay and also trains your hair to grow in a downward direction. We recommend the Smooth Viking Beard Brush, which uses 100% bristles from wild boars and no synthetic filler bristles that can detach while brushing or irritate the skin underneath. If you also want a beard comb, the Grow a Beard Brush and Comb Set is an excellent option with a smaller boar bristle brush and bamboo comb. The brush can fit in your pocket for anytime grooming. It’s important to wash your beard regularly, particularly in the early growth stages when dead skin and other particles can make your face itchy. Scrub your beard several times a week with a special beard cleanser, like Professor Fuzzworthy’s Beard Shampoo. This 100% natural shampoo bar has special anti-itch and hydration properties, including Leatherwood honey, bees wax and Kunzea Oil, found only in Tasmania, Australia. Of course, pruning is a must for a well-groomed beard — even if you’re growing it out. Invest in a quality pair of grooming scissors to snip off split ends and stray hairs. Equinox Professional Shears are barber quality and razor sharp. They can help give you a healthy, well-maintained look. Once your beard fills in more, you’ll need a trimmer to maintain the shape and style you want. The Philips Norelco Series 3000 is a top seller on Amazon with tons of five-star reviews. This full-size, steel-precision trimmer comes with three beard trimming guards, a stubble guard, three hair trimming guards, a nose and ear hair trimmer and more. If you don’t want to purchase each grooming product separately or want to save some money, consider investing in a beard grooming kit. The Rapid Beard Grooming & Trimming Kit comes with all the high-quality products you’ll need to get started on growing that beard you’ve always dreamed of: unscented, all-natural beard oil and beard balm, a 100% boar bristle brush, a beard comb and extra-sharp barber shears. This kit also makes a great gift. What are beard clubs? Monthly beard clubs are an excellent way to take the hassle out of having to shop for beard products continually. You can sign up for (or gift) a subscription that delivers a variety of top-quality beard grooming products to your door every month. Here are our top picks and reasons why we love them. 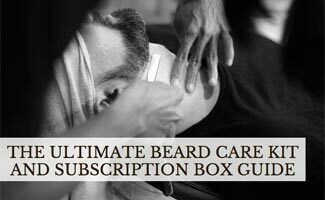 The Beard Club (formerly the Dollar Beard Club) allows you to create a custom-made box of all-natural beard care items from the Uncut Beard Co. product line. You start with your choice of a .5 oz beard oil (natural or sandalwood) for $1 per month. Then you’re prompted to four subsequent product pages — Essentials (balms, waxes, etc. ), Shower Items, Accelerators (growth oil, spray or vitamin supplements), and finally Accessories (a one-time purchase of a comb or brush). Your picks for the first four categories will ship every month, but you can always change your product selection or cancel membership anytime. Prices are extremely reasonable for the number of products you get. Your customized beard subscription box arrives at your door every month. And they offer a money-back satisfaction guarantee. Pricing ranges from $21 to $40 per month (no membership fees). All of the Beard Care Club’s products are hand-crafted, one batch at a time in the U.S.
All balms, oils, and waxes contain nine essential oils that help promote beard growth while softening your beard. You can choose between beard balm, beard oil, or mustache wax monthly subscriptions. They also offer seven different monthly combo packages (some include beard shampoos, conditioners and washes). They ship new scents every month, and customer reviews are largely positive about the fragrances. You can cancel your monthly beard box subscription anytime. Pricing ranges from $7.50 to $61 per month (no membership fees). Are you a big fan of Badass Beard products? If so, you may want to consider joining the Badass Beard Club. This club is more than just a product subscription; you get some attractive members-only pricing discounts and other benefits. Choose how often you want your products delivered. Pricing ranges from $14.99 to $43.99 per subscription box (no membership fees). They also offer several add-on products. Are You Going For A Certain Beard Look? The fun part is the plethora of beard styles to choose from. Check out the video below for ideas and how to pick a look based on certain face shapes. Having Trouble Growing A Full Beard? Be sure to read our reviews of the best beard growth products if you can’t seem to fill in those patchy areas or feel like your beard needs more fullness. There are certain oils and balms you can apply to your beard or nutritional supplements you can take to promote healthy beard growth beyond what we’ve covered in this article. Also be sure to check out our shave club reviews if you are looking to get rid of your beard. What beard grooming products would you recommend and why?